Coca-Cola rewards people for drinking their products by letting them redeem codes on their packaging to participate in offers like sweepstakes entries, free drinks, discounts from their brand partners, and more. Many people simply throw the Coca-Cola packaging away without redeeming their codes, but that is a mistake. The few moments of time it takes to redeem the codes on your Coke purchases can be turned into big discounts, free stuff, or big prizes, making the Coke Rewards program a good way to stretch your budget. Unlike the previous My Coke Rewards program, you don't need to build up points to redeem for product offers. Instead, you take advantage of offers by redeeming codes. For example, you might choose to participate in an offer where you can enter two product codes to receive a free drink at a participating store or enter a single product code for a chance to win a prize. To find which rewards are available at any given time, visit the Coke.com offers page. You can also check out some of Coke's current sweepstakes listed at the end of this page. To comply with U.S. law, Coca-Cola offers a no purchase method of entry for its giveaways, so you don't need to have a code to enter. 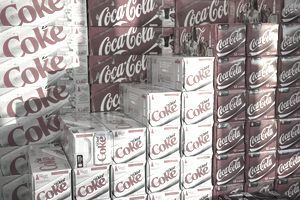 Some of their giveaways require that you enter by mail if you don't want to use a code, but others offer free online entries.To find out what your options are, read the rules of the individual giveaways on the Coke.com website. What Is the Coca-Cola Give Program? Coca-Cola Give is a program that allows people to redeem their Coke codes to help local schools and other causes such as the Boys and Girls Clubs of America, the National Park Foundation, and St. Jude's. Each code you enter gives the school or charity of your choice a donation worth between $0.05 and $0.38, depending on the product. While each code might not be worth much on its own, the micro-donations add up fast, given the number of people who consume Coke products. The codes can be found under the cap of individual bottles, on the cardboard box of 12-packs of cans (in the refrigerator boxes, the codes can be found on the part you tear away to get to the soda), and on multi-pack wraps. See the Coca-Cola website for a full list of participating brands and sizes. What Happened to the My Coke Rewards Program? Coca-Cola started phasing out the My Coke Rewards program in January of 2017. They announced a deadline for entering new codes in March of that year, with some rewards still available to redeem until June 30, 2017. However, their rewards catalog quickly sold out of popular gift cards and subscriptions and those rewards were not replaced, leaving slim pickings for people redeeming offers toward the end of the program. As of June 30th, the My Coke Rewards program is disappearing altogether. Visiting the former website will result in a redirect to Coke.com and all email lists and social media accounts for the MCR program will be shut down. Any MCR points that have not been redeemed by the end of the day on June 30th will be donated to charity. You can stretch your budget even further by gathering codes without spending money on Coke products. I have some tips on How to Get Coke Codes for Free, which include signing up for emails from Coca-Cola and other helpful tips. Read that article to help you get more codes, faster and cheaper. If your country isn't listed, try an internet search for your local Coca-Cola site to see if there's a rewards program that you can join. For fans of Coke, Sprite, or other Coca-Cola products, signing up for the Coca-Cola Rewards program is a no-brainer. Earning points is easy, and you can exchange them for free things that your household is sure to need. If you don't drink Coke products regularly, you can still participate in the rewards program, using the free collection methods. Enjoy! Want more sweepstakes tips? Sign up for my free sweepstakes newsletter to get winning tips and sweepstakes to enter, delivered straight to your inbox for free.